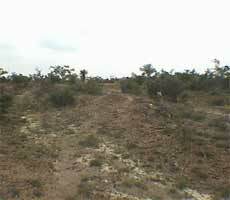 A. trigonus LRM292, habitat in the vicinity of Fortin Agrario. A. trigonus LRM292, a clustering specimen. A. trigonus LRM292, a young adult plant. 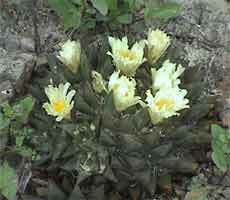 These plants, in complete contrast to LRM316, are, perhaps, at the southerly end of their range. They are very similar in body and tubercle form to the extreme northerly LRM316 and to the more easterly populations in the Jaumave Valley. 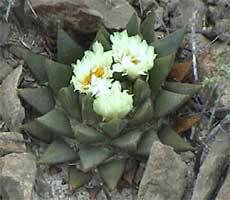 The plants, which grow on low limestone ridges amongst mud pans, are accompanied by Astrophytum asterias, Thelocactus bicolor var. schwarzii and Ancistrocactus scheeri.